Age: 4–10 years. An educational book filled with unimaginable adventures. 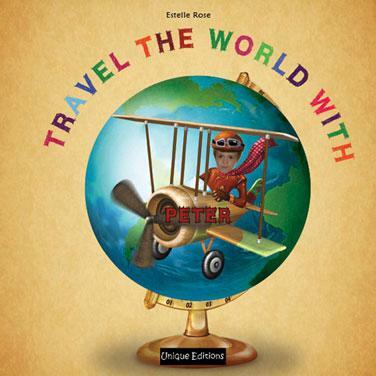 Your child takes a journey across the globe and discovers the different continents, their people and their cultures. This book is bound to delight any young explorer. Book description : 30 pages, size: 20 cm x 20 cm, with thick high quality paper, using professional digital printing, and a durable laminated cover. Detailed description & page through book by clicking here. Age: 4–10 years. Unique Editions presents the first personalised educational book that takes your child on unimaginable adventures. She takes a journey across the globe to discover the continents, their fascinating people and cultures. The story will delight all young explorers, offering an entertaining story with interesting facts on every page. Vivid acrylics and rich colours bring the book’s brilliantly realistic illustrations to life. Personalisation : The photo of the child appears 15 times, and the name 25 times. There is also an option to create your own personalised message to the child, that appears at the beginning of the book. The success of your personalised gift relies on the quality of the photos you provide. To give you the time to select the best photos, personalisation takes place after you place your order. - After payment, you will be directed to your personalisation page. - You will see a summary of your order and will be able to modify it if you wish. - For personalised books and personalised pictures, you will receive a digital preview via email before it is shipped. - We will contact you if there is a problem with your photo to ensure you receive a high quality product. Learning can be fun with this personalised book. Children between four and 10 years are getting to know the world far from home and this book teaches them more while keeping the magic alive. If there's only one thing personalized books do well, it's entertain. When it comes to great story telling, kids love a compelling yarn as much as grown-ups do. Travel the World delivers, giving parents a way to develop a love for reading in their children. When parents read personalised books to their children, the bond between them is made far stronger than, say, the reading of The Very Hungry Caterpillar. Recent studies have found that if you let your little one choose the photographs and story of her own personalised book, her interest and your bond will balloon even more. The link between you will be strengthened.While academics can study and theorise, they can't always pinpoint the ever present 'why.' Even after thousands of global studies, no professors have been able to tell us why reading to children is so powerful. The fact remains that personalised books have a mystical power over children. We don't need to know why to get their results.